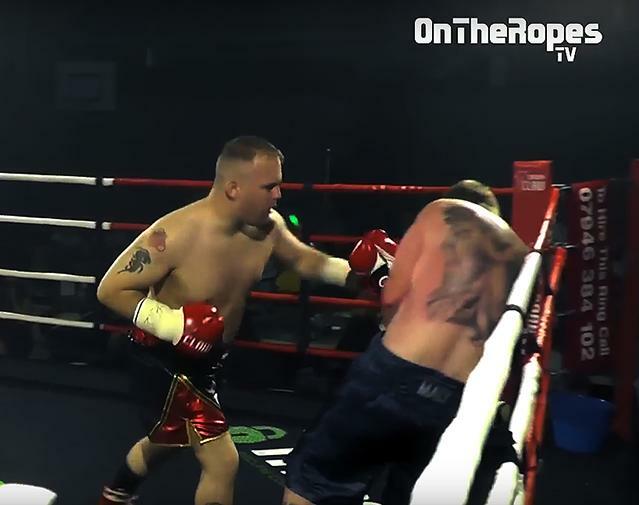 On Saturday evening, at the On-X Centre in Paisley, the latest offering from Gerard Boyle-Welsh and his On The Ropes team took place. For those that have yet to attend an On The Ropes promoted event, this may be small hall boxing, but believe me the production quality of their events easily equals, if not betters, many of the larger Arena shows from far better known promoters. It’s not often you see full blown light show, DJs, big screens, stunning promotional girls, full in house broadcast team not just filming the fights but also post fight interviews at small hall shows. OK, enough about the production let’s get to the point of the report – The fights themselves. First fight of the night see Coatbridge’s Ben McGivern against debuting Malcolm Richardson from Blackpool. Right from the off this bout had the hallmark of a classic small hall fight written all over it. Both lads got straight down to business, attacking from all angles in some style. However around the first minute or so of the round local lad McGivern landed a massive shot to the body. Have to admit, the shot was so venomous I was mightily surprised, no that should be impressed, that Richardson made the count. On the restart McGivern didn't need the partisan fans in attendance or his esteemed corner man on the night, three time World Champion Lee McAllister, encouraging him to get back in hard and fast, he just did, landing further big shots to back his not yet fully recovered opponent on to the ropes, before letting rip with yet another massive right to the body with much the same effect as the first, Richardson valiantly tried to rise as the count reached its conclusion, but just failed to do so – Referee Liam Bonner waved the bout off and declared McGivern the victor on the one minute and twenty eight second of round one. Next up was Perth’s Gary Wilson against debuting James Calveley from Liverpool. To an outside observer this may have looked a bit of a mismatch, as Wilson towered over Calveley by a good six inches or so, but fight wise it was anything but. First round see the protagonists locked in a gladiatorial battle that wouldn't have been out of place at the Colosseum in Rome all those years ago – seriously was a cracking round that swung one way and then the other as they battled it out in centre ring. Initially it was more of the same in the second that was until Wilson landed a peach of a shot to send the plucky Scouser down. Calveley made the count easily but Wilson had no intention of letting his opponent off that easily and kept the pressure up with some nice combinations culminating in another huge right to send Calveley down again. Calveley just about made it to his feet as the count reached eight, but on rising was very, very unsteady on his feet, so much so that referee Liam Bonner had no option but to stop the contest on the one minute fifty one second mark of the second round. The third contest of the evening see Bellshill’s Barrie McRorie take on tough and very awkward Latvian Vladislavs Davidaitis. The round started quite sedately with both men sussing the other out for the first minute or so, then it was all action to the final bell, as the two warriors let rip from every conceivable angle. Round two was more of the same although to be fair both protagonists had settled into a slightly more realistic pace and were landing far better shots than in the first. Round three see Davidaitis getting more and more success, don't get me wrong McRorie was landing some real tasty shots of his own, but have to say that was the Latvians round. The fourth and final round was a cracker, as in the previous rounds the two lads went at it hammer and tongs throughout, however the pace had taken its toll on Davidaitis and the final minute he was fighting his heart out just to survive the continual onslaught from the fired up Scotsman. After four scintillating rounds Referee Liam Bonners scorecard showed McRorie victorious by a 39-37 points score line. So onto the final bout of the night, which featured Bellshill’s Paddy Reilly against Vadims Konstantinovs. Konstantinovs’ fight style is similar to fellow Latvian Vladislavs Davidaitis, as such Reilly had his hands full, albeit right from the opening bell, as unlike in the previous fight both protagonists had only one thought in the mind - attack, attack, attack. It was a full on war, both lads were intent on throwing as many big punches as possible, at the expense of their defences I should add, which ultimately led to Konstantinovs being caught by a cracking shot, that sent him to the canvas around the end of the first minute. The Latvian made a right mess of judging when to rise, whilst on one knee he kept looking between the referee and his corner as he awaited the signal, which he got back a fraction too late, rising only as referee Liam Bonner actually counted and signalled the eighth time, not just before. Not only was Konstantinovs distraught when the referee signalled fight over but so was Reilly who was fired up and wanted the fight to carry on, well he's a fighter and he wanted to fight so can understand that. Actual time of stoppage was one minute and forty-nine seconds of the first round. What a great night, OK three of the four fights were over well inside the distance, but that can't take away from the performances of the fighters or as I mentioned at the start, the quality of the promotion itself, I for one can’t wait for the next.